As big fans of Bar27 and its musical guru Olivier Weiter, we got very excited when we heard that they are going to help us dance off all the fat from this year’s Christmas dinners. The 27th of December, also known as the 3rd day of Christmas, fits perfectly with Bar27. From now on, they will bring their Wunderbar concept to the Melkweg once a year, and transform the famous concert venue into something like you’ve never seen before. Music, madness and entertainment await you! Something you will definitely need after two days of terror from the family and in-laws! 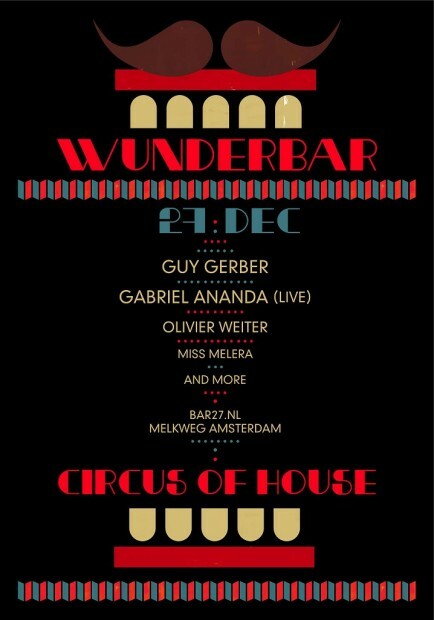 This edition of Wunderbar is named The Circus of House and will be a modern day interpretation of the circus: a place where music, art and entertainment come together, but where the experience of the visitor remains central. Wunderbar aims to be warm, cosy, extravagant and something people will want to relive over and over again. For the line-up, they’ve chosen artists that provide the perfect build-up and backdrop to this playground for house lovers. Have a listen below to get a taste. The day after Christmas will never be the same..